I don't know how Dora the Explorer and others like her do it. Born with a tracking gene, they can find their way out of anywhere. Not so with me. 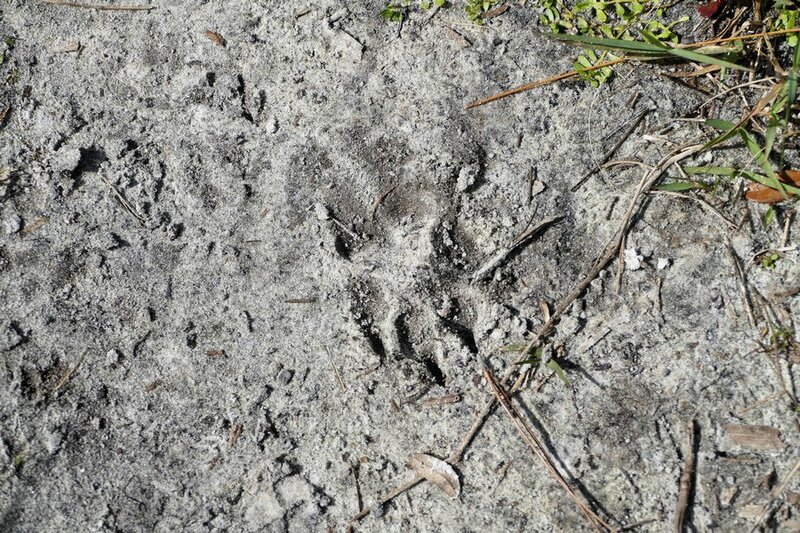 Today I decided to go to Myakka State Forest in North Port to check out the wildlife. The first time I went here, I expected a woods along the river. I was disappointed when I didn't see the river, but I was blown away when we encountered a six foot Diamondback Rattlesnake crossing the road. The snake was HUGE. His girth was enormous! That's why I decided to go again. It was a cool day. It was sunny. Maybe, just maybe, that snake might come out of hiding and want to get warm on the little-used road. Maybe I would see him again. Unfortunately he was nowhere to be found. I decided to park my car and walk into the woods a bit to see what might be there. I was surprised to find a tree-stand. Hunting and hiking didn't seem like a good mix to me. Maybe it was being used for other purposes. Figuring I should have parked in a designated parking area, I left and instead stopped at a picnic area. No hunters were in the area. Instead, there were picnic tables in the woods. Because I wanted to know how many tables there were, I followed the trail to see how many tables there were, four tables! Since I had already started down the trail, I figured I may as well continue to see where it went. Naturally I started to take pictures. The path was in great shape and was wide enough for vehicles if they would have been allowed. I continued taking pictures....following various paths. I came across a trail site for gatherings.... and continued to follow a path past it until it led out to the park road. Now my choice was to go out to the road and follow it back to my car or back-track on the trails I had taken (like Dora would have done). I took the trails. On and on and on I walked, taking split after split after split.... "WHERE WAS MY PATH BACK TO THE PICNIC TABLES???" I thought I would recognize the split back because when I took the first split, I put the sun at my back (since I was taking pictures) and I took a photo of some kind of animal track that I figured had been attracted to the picnic tables. I noticed three main "toes" with pointed claws on the front of the foot. The animal track seemed rather large and I figured surely I would notice it when I got back to this spot. What I didn't put together was that the animal LIVES here and his track would be EVERYWHERE! I saw that track where there were NO trails. I saw that track where there WERE trails. I took those trails. WRONG TRAILS! Stupid cat! Then I'd have to back-track and try to remember, "Did I go left or right when I did that?" I was constantly having to decide whether to try a portion of the trail again. Did I miss an off-shoot??? What if it were just ten yards more? For over an hour I walked and walked and walked. NO THOUGHT OF TAKING ANY PICTURES NOW! I wanted out of there. One time I could hear the sound of heavy vehicles and figured a fast road was nearby and then I had to debate whether to go forward or go back. I turned back. What if that were River Road and my car was way back in the Myakka State Forest??? Another time I had to choose whether to slop through water and mud to get to the park road. I could see the park road, just a short distance away. "Were there any cotton mouths in that muck?" I wondered. I turned back. Eventually I decided my only way out was to go waaaaaaaaay back to that trail site for gatherings. At least I knew where that path went. I didn't look for cat tracks. I didn't look for paths back to picnic tables. I didn't take any pictures. I was on a heading and that heading was THE ROAD!!!! By the way, when I finally got home, I got on Amazon and ordered some trail markers that hunters use. Maybe that'll work.